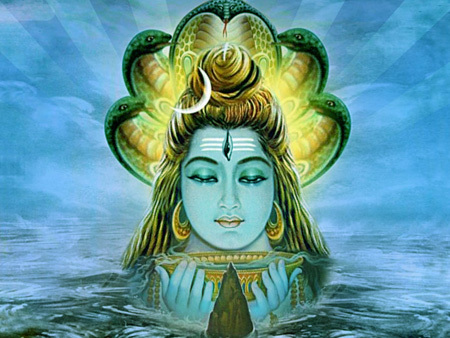 A legend explains the all-night worship of Shiva on Shivratri. There was once a poor tribal man who was great devotee of Shiva. One day he went deep into the forest to collect firewood. However he lost his way and could not return home before nightfall. As darkness fell, he heard the growls of wild animals. Terrified, he climbed onto the nearest tree for shelter till day-break. Perched amongst the branches, he was afraid he would doze and fall off the tree. To stay awake, he decided to pluck a leaf at a time from the tree and drop it, while chanting the name of Shiva. At dawn, he realized that he had dropped a thousand leaves onto a Linga to keep himself awake, the tribal plucked one leaf at a time from the tree and dropped it below which he had not seen in the dark. The tree happened to be a wood apple or bel tree. This unwitting all-night worship pleased Shiva, by whose grace the tribal was rewarded with divine bliss. This story is also recited on Mahashivaratri by devotees on fast. After observing the all-night fast, devotees eat the Prasad offered to Shiva. There is another possible reason for the origin of the all-night worship. Being a moonless night, people worshipped the god who wears the crescent moon as an adornment in his hair, Shiva. This was probably to ensure that the moon rose the next night. Immediately after Mahashivaratri, almost like a miracle, the trees are full of flowers as if to announce that after winter, the fertility of the earth has been rejuvenated. 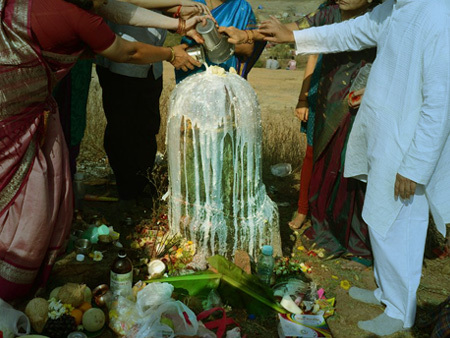 And this perhaps is the reason why the Linga is worshipped throughout India as a symbol of fertility. The festivities differ in various parts of India. In southern Karnataka, for example, children are allowed to get into all kinds of mischief and asking for punishment is the rule of the day, probably originating from the mythological incident of Shiva punishing Brahma for lying. TheVishvanatha Temple at Kashi inVaranasi celebrates the Linga (symbolic of the pillar of light) and the manifestation of Shiva as the light of supreme wisdom.